Chinese Grand Prix: A Shanghai surprise or Mercedes to bounce back? Venue: Shanghai. Dates: 7 April to 9 April. Coverage: Listen on BBC Radio 5 live and BBC Radio 5 live sports extra. Read live text commentary, analysis and social media on the BBC Sport website and the sport app. For the first time in what seems like an eternity, Mercedes are not leading the championship. Granted, we are only one race into the season, but Ferrari's win in Australia hints at a potentially closer title fight this season. This week, Formula 1 is in China, leaving behind the street circuit in Melbourne for the more traditional F1 track in Shanghai, where the impact of significant changes in regulations and car designs should become more evident. How did the season opener go? Is Nico Rosberg missing F1? Arriving into the futuristic city of Shanghai for the race, spectators and team personnel alike might be forgiven for thinking they have stumbled into a scene from Blade Runner. Skyscrapers of all shapes and sizes stretch into sky, while elements of Shanghai's past remain as grandiose old stone buildings hug the Huangpu River. For those heading to the F1 a stop in Shanghai is only brief, as they head out to the industrial outskirts of the city where the track itself is based. The circuit's surroundings may not be particularly pretty but just being in China provides a visitor with the opportunity to sample true Chinese cuisine, something Max Verstappen is particularly excited about. "I have good experience of it already in Holland but you always have to try the real stuff when you are in China," said the Red Bull driver. "I do have to be careful with my diet not to eat too much Chinese though as I really like it." Lewis Hamilton. He has won more Chinese GPs than any other driver (four) and the Mercedes' pace on the longest straight in F1 could well see him disappear from his rivals. After losing to Sebastian Vettel in Australia, Hamilton will no doubt be hungry to get his season up and running in China. McLaren. Fernando Alonso has won in China twice before but, while McLaren perhaps surpassed expectations in Australia - at least until Alonso retired - this circuit could prove tricky for the team. "I can predict that we won't be as fortuitous with our pace, compared to our rivals, as we were in Australia," said McLaren racing director Eric Boullier. "The characteristics of the Shanghai International Circuit are very different from Melbourne, and its long, fast straights will likely expose the weaknesses in our package more than Albert Park did." Lewis Hamilton is the most successful driver in China with four wins. His last was in 2015. 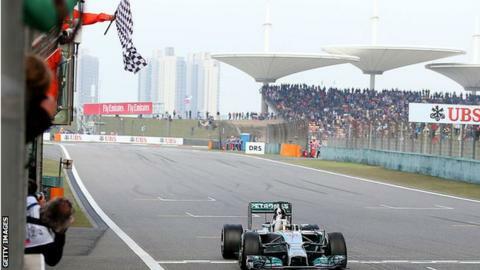 The lowest position any driver has started and gone on to win in China is sixth. That was achieved by Michael Schumacher in 2006, when he beat polesitter Fernando Alonso by 3.1 seconds. The last non-Mercedes winner of the race was in 2013, when Fernando Alonso triumphed for Ferrari. The race made its debut on the calendar in 2004 and eight of the 13 Chinese Grands Prix have been won from pole. Is Rosberg missing Formula 1? Read more on Nico Rosberg: Attending testing, watching races on TV... is the champion missing F1?